#1. Mitchell McCarron (6'3''-G-92, graduated '15, plays pro in Australia) led Melbourne United to a victory over one of league's weakest teams New Zealand Breakers (11-15) 111-102 in the Australian NBL in Sunday night's game. He was MVP of the game. McCarron recorded 25 points, 8 rebounds and 6 assists in 33 minutes. Melbourne United (16-9) is placed second in the NBL. It was his team's fourth consecutive victory in a row. There are only three games left until the end of the Regular Season. So now every game will be critical. It's McCarron's first season with the team. He has relatively good stats this year 11.6ppg, 5.2rpg and 2.9apg in 25 games he played so far. #2. 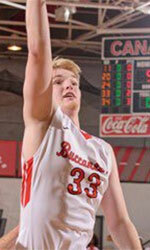 Experienced David Barlow (6'9''-F-83, graduated '03, plays in Australia) is a teammate of previously mentioned Mitchell McCarron. But that was another game of his team in Australian NBL which we would like to mention. Barlow could not help one of league's weakest teams Melbourne United (16-9) in their last game on Friday. Despite his good performance Melbourne United was defeated 97-85 on the road by the leading Kings. 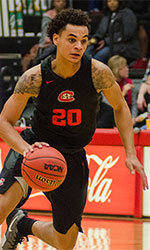 Barlow scored 12 points, grabbed 6 rebounds and dished 3 assists. Barlow has relatively good stats this season 12.5ppg, 4.7rpg and 2.2apg. #3. Brandon Jefferson (5'9''-PG-91, graduated '14, currently in France) contributed to an easy victory against the seventh-ranked Gries/Oberhoffen (11-7) 91-73 in the French ProB (second division) on Saturday night. He scored 9 points and grabbed 4 rebounds in 26 minutes. Entente Orleans 45 (13-5) is placed third in the ProB. It was his team's third consecutive victory in a row. It's Jefferson's first season with the team. Jefferson has individually a very good year with high stats. He averages 15.8ppg, 2.8rpg and 5.7apg in 18 games. #4. Benjamin Ortner (6'9''-C/F-83, graduated '05, plays pro in Italy) was not able to help one of league's weakest teams one of league's weakest teams Grissin Bon Reggio Emilia in their game against Fiat TO (6-13) in the Italian Serie A. He scored 6 points and grabbed 4 rebounds. Grissin Bon Reggio Emilia was badly defeated 77-58 in Torino by the higher-ranked Fiat TO (#14). It was Grissin Bon Reggio Emilia's fifth consecutive loss in a row. It's Ortner's first season with the team. This year Ortner averages 5.3ppg and 2.8rpg. #5. Peter Moller (6'3''-F-94, graduated '18, plays in Denmark) was not able to secure a victory for Svendborg (12-6) in their game against Randers (12-9) in the Danish BasketLigaen. He did not have that impressive stats last Wednesday. Moller recorded only 2 points in 11 minutes. The third-placed Svendborg (12-6) was edged 72-69 at home by the lower-ranked (#5) Randers in the ProA group. It was Svendborg's first loss after three consecutive victories. This year Moller averages 9.1ppg, 2.4rpg, 1.7apg and 1.3spg in 15 games.